It seems that everywhere one turns there are new colors your supposed to wear this summer, the hottest shoes seen in store everywhere, right down to the newest engagement ring design Angelina Jolie is sporting. When it comes down to it though, these products only carry value if someone finds them appealing. The same bright orange shirt that looks amazing on one person may make another look like a pumpkin. The same game applies to Fancy cut diamonds, or “fancies”. A fancy cut diamond is any shape other than a round brilliant and includes popular cuts like princess, marquise, emerald, radiant ect,. Many times jewelers will use Fancy shapes as an alternative to a round brilliant if the buyer is looking for something less traditional. Fancy cuts have their own unique beauty, and often carry eye-catching appeal to many. However, the same individual who prefers a pear shaped diamond may not like the look of a radiant cut. This is where fancies start to get tricky. Since round brilliant cut diamonds have traditionally been the most sought after, recognized, and methodically cut they hold a much higher value than fancies. There are specific industry standards, and agreements in regards to what measurements, angles, and proportions produce the most brilliant rounds. Factors used to evaluate and assess round brilliants are quite precise, however with fancy cuts there are many more variations to keep in mind. When someone grades a fancy cut they look at the same types of things they do for rounds- color, clarity, symmetry ect. However, unlike rounds there is no universal agreement about what makes a specific fancy cut beautiful: it is a matter of personal taste. For example, an emerald cut that is an elongated rectangle may appear too narrow and long for one individual, but elegant and slender to another. The beautiful individuality that is associated with fancy cuts is also what can make them a challenge to sell. The ever changing past and present trends of the jewelry industry can also pose a challenge to a seller of a fancy cut. For example, marquise cut diamonds became quite popular in the 1970’s and while still available, their popularity and demand has declined, impacting their re-sale value. If you have a fancy cut you are trying to sell, it is important to keep in mind that while the beauty of the fancy cut diamond is obvious to you, there may be difficulty in finding someone who feels the same; pricing the diamond appropriately can help. This can also lead to a long waiting game, which ultimately could never result in a sale. Often times our clients find it better to re-circulate their fancy cut stones directly back into the market rather than waiting for the perfect private buyer to come along. While Angelina Jolie may adore the emerald cut diamond that now adorns her finger, others may look at it with distaste. Beauty is in the eye of the beholder, and nothing is more apparent than with fancy cut diamonds. Trends within the diamond industry will continue to change with the times; the only trend that has and will not receded is the beauty, elegance, sophistication, and desire of a diamond. When it comes to selling something, whether it’s a complex electronic or a chocolate chip muffin, it is critical to know what you’ve got. If you were at a local bake sale and asked if the chocolate chip muffins had nuts in them, and the baker replied, “I don’t know”, you likely would not take the dive to check yourself, especially if you had a nut allergy! Let’s say the baker said that there are no nuts, but you looked at the price and each muffin was $15- you would ask yourself where this baker parked their spaceship. In order to sell something properly, you not only need to have an idea of what your selling, but also need to ask an appropriate price that is reflective to what a buyer will pay. While diamonds are more complex than muffins, these same guidelines hold firm. As discussed in previous posts, diamonds are more complex than just being a stone. Each diamond is unique, and commands it’s own value based on it’s carat weight, color, clarity, and shape. When selling a diamond, whether it is loose or mounted, it is important to know these four characteristics. Without these it would be nearly impossible to know how much you could sell your diamond for. So how do you know what you have? Well, if your diamond is certified you will find LOADS of information listed right on the certification. Be sure to provide not only the four characteristics, but also any other information listed in order to give a potential buyer all the knowledge they need. Now you’re telling them that the muffin not only is nut-free, but also gluten-free and low-fat! If you have an appraisal that was done on the diamond, you will find almost as much information as you would find on a certification there. Many people may have no paperwork that came with the diamond, or have lost track of it over the years. In this case, it would be important to consult a GIA certified diamond professional, like MJ Gabel, to look at the diamond to give you information on what you have. When listing the information you have found on your stone, be sure to list where the information came from. This makes it easier for a potential buyer to gage that the information you are providing is reliable and credible. So now you know what you have, what do you ask for it? This water can be muddier than finding out the characteristics of your diamond. Keep in mind that an appraisal, or certification may have either suggested retail values, or replacement values listed on them. These numbers are not realistic or reflective of what you could expect a private or other buyer to pay for your piece. The best was to know is to start price shopping your diamond on a wholesale level. BlueNile.com is the leader in non-traditional diamond sales. They sell diamonds to the public close to what a jeweler could buy the same stone for. You can easily do a diamond search based on the information you have discovered about your stone, and automatically see what they are selling the exact same stone for new. Knowing that an individual can buy the same diamond you have for X amount, you now know you need to ask less than that to sell it properly. Back to the muffins; you know you can buy that gluten-free, nut-free, low-fat muffin down the street for $4, you would not spend $15 on the same product. Doing some basic research will go a long way when it comes to price negotiating during a sale. Just like not everyone is a gifted baker, not everyone is a born seller. Simple steps though can make selling your used diamond a much easier task than one might think. Knowing your diamond gives you the confidence that you know what you’re speaking to. Also, having an idea of true market values help make the negotiating process less painful and prevents dreams of getting close to the appraisal value from being shattered. It can be somewhat of a reverse sticker shock when it becomes apparent that those appraisal values are nowhere near what someone is willing to pay. Keep in mind that it is a buyers market, and while you can ask whatever price you want for your diamond, it is the buyer who will dictate the price they are willing to pay. More to come on selling and keeping an open mind to the process! Be sure to check out www.mjgabel.com. If you are in the market to buy a diamond, or selling a loose or mounted diamond get in touch with us and take advantage of our free consulting. Many diamonds today come with handy paperwork known as an appraisal. It is explained to many that the dollar amount on the appraisal is the “value” of your diamond. It is important to understand fully what an appraisal is for, and what the value of the appraisal represents when it comes time to sell your diamond. An appraisal of a diamond is like any other appraisal done on a piece that carries value and may be covered under ones insurance. The appraised amount of a diamond is one that has been assigned to the piece in the event that it needs to be replaced. In other words it is a slightly inflated reflection of the retail value of the piece. If the diamond was lost, stolen, damaged and it was covered under one’s insurance, the appraisal amount is what would be covered. Consumers must keep in mind that the appraisal amount of their diamond is really only beneficial under these circumstances. The resale and liquidation values are more important to keep in mind when selling a diamond. A resale value is one that a consumer could expect to receive from a private buyer. This is an individual who is looking for a diamond that you may have. This person understands how much they would expect to pay for the diamond in a retail setting, and therefore is willing to pay below the retail price, but above the liquidation price of a diamond. A liquidation value of a diamond is one that represents what the polished diamond is actually worth within the diamond marketplace. 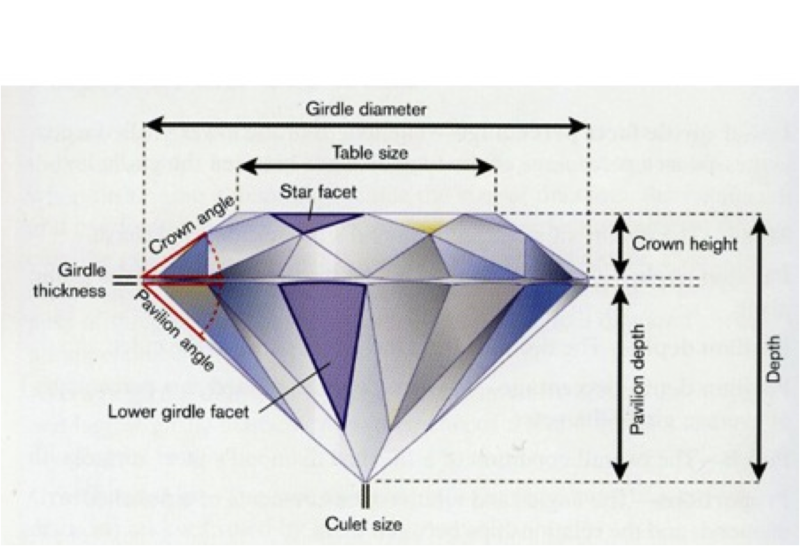 As discussed in previous articles, diamonds go through various phases before reaching the retail counter. These are the mining, production, sorting, cutting/polishing, distribution/wholesale, and retail phases. The diamond’s value increases as it climbs through each step. The liquidation value refers to the diamond’s worth at the cutting/polishing phase. This is the typical amount one could expect to receive from a jeweler or pawn shop for their diamond. At MJ Gabel, we have the ability to give amounts to our customers that are reflective of the distribution/wholesale phase of the diamond pipeline. This is why our amounts are higher than a jeweler. Our ability to give a more competitive amount is directly related to our belief that the consumer should get as mush as the market will command for their diamond. Keep in mind that between the phases of distribution and retail is where the majority of profit is made on a diamond, which goes directly to the jewelers. 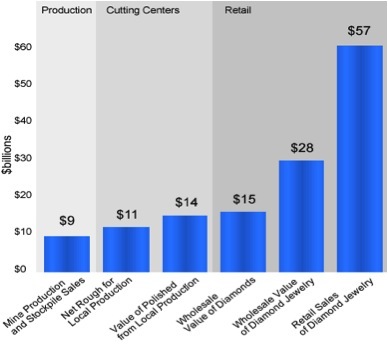 This is a rough breakdown reflected in billions of dollars of the diamond pipeline. It is clear to see that the highest potential for profit remains in the retail sales portion of the pipeline. When you go to sell your diamond, unfortunately you cannot ask the new buyer to pay for the profits you originally paid the jeweler. Most individuals recognize that while diamonds may never be worth exactly what they paid for them, often times they rely of the values and amounts they are told their diamond is worth at the time of purchase per their appraisal paperwork. It can be difficult to walk straight in a hazy cloud of retail values, appraisal values, liquidation values and everything in between. This is why at MJ Gabel we do our best to educate the consumer the entire way through the process, and help to obtain the highest amounts possible for our client’s diamonds. O’Neill, Sean. “Clicks & STONES.” Kiplinger’s Personal Finance 60.2 (2006): 102-105. Academic Search Alumni Edition. Web. 28 Feb. 2012. “The Conflict-Free Diamond Council.” The Conflict-Free Diamond Council. 2004-2009. Web. 03 Apr. 2012. <http://www.conflictfreediamonds.org/home.html&gt;. The Diamond Pipeline. A breakdown of the world travels of Diamonds, and who pays the bill. The fine jewelry industry seems to be perpetually filled with notorious mark-ups and yet what appear to be constant blow out sales. Diamonds fall directly into this mysterious game of price shopping, and sale hunting. How is it that a jewelry sales person seems to always be able to pull out a calculator and knock down the already 60% off price of a diamond engagement ring another few notches? Who is getting the good deal: are diamonds truly as expensive as they appear? At the retail end of the diamond spectrum, diamonds truly are as expensive as they appear, but why? If a diamond’s market value is less than it’s retail value, where is the money going? In order to get an idea of what goes into the price ticket on a diamond at your local jeweler, it is important to understand how a diamond gets into the showcase to begin with. By the time a diamond reaches your local jeweler, it has already traveled around the world. The majority of diamonds are mined in only six of the world’s countries: Botswana, Russia, South Africa, Angola, Namibia and Australia. Rough diamonds are immediately graded for their value when they initially are extracted from the mine by a “diamond valuator” (Diamond Consultants, 2012). The valuator looks at each rough diamond for their size, color, quality, shape, and cuttability. Each rough diamond has the potential to be cut into a multitude of different polished diamonds, and thus are separated into up to “12,000 different categories in preparation for sale” (Diamond Consultants, 2012).